Before you send your kids off into the world on their own, there’s a lot you probably want to teach them. In an effort to help you identify the important things your kids should learn, we’ve compiled a list of 100 life lessons to teach them, from learning to show others respect to being able to communicate effectively and everything in between. While showing others respect may not seem to be a lesson that many kids learn these days, there’s still time to teach the younger generations how to be courteous and polite. However, we, as parents, have to take the first step toward making this a reality by teaching kids how to act appropriately. To make being respectful commonplace again, check out these 10 life lessons to teach your children. Avoid cursing and screaming. Dr. Robyn Silverman explains that parents need to treat kids with respect and model respectful behavior to teach kids to act the same. Use proper manners. Parents agree that modeling respectful behavior is important, as is expecting that same respect and good manners from your kids. Be on time. Today’s Parent suggests showing kids how to use calendars and planners to keep track of homework and other obligations so they can be on time. Being on time shows others you respect their time. Show courtesy to others. Inspire Conversation recommends starting to show your child how to be courteous to others as early as possible. Use a person’s title and last name when addressing him. Kids often learn this at an early age when addressing their teachers, but some teachers allow their students to call them by their first name, which can be confusing. Better Parenting Institute explains that when meeting people it’s only acceptable to use a first name if you are invited to by the person. Dress modestly and respect yourself. Power to Change explains that dressing modestly shows respect for yourself and your family. Show gratitude. Your Tango writes that you can start teaching gratitude at an early age by explaining why you are grateful for something, which helps to reinforce the concept. Help others and be charitable. Encourage your child to help an elderly neighbor rake leaves or carry their groceries and stress the importance of helping others, says Voices. Greet people when they enter a room. Palo Alto Medical Foundation urges kids to stand up when greeting other people, even if it’s not the first time they’ve met. Treat others as you want to be treated. Good Character points out how simple it is to be respectful to others; simply treat them the way you would like to be treated. When your child goes off to college he may be in a dorm where food is provided, or he may have an apartment where he will need to know how to cook. While eating out for every meal is certainly an option, it’s also one that quickly gets expensive. Help your child learn to thrive on his own by teaching him these 10 cooking related life lessons. Teaching proper knife skills. Eat Your Beets explains how to hold a knife properly and details various techniques for chopping food. Learn to read a recipe. Kids who can read and have the dexterity to control a knife should be able to read and follow a recipe, but there are measurements that can be tricky. Learner explores different ratios and how to follow a recipe. Know how to make coffee. Lifehacker goes through the steps required to make the perfect cup of coffee. Learn how to scramble eggs. The Guardian explains various ways to make scrambled eggs. Follow the steps to make a pasta dish. Parade shares a recipe for I Love You So Tortelloni-O’s that you can show your kids how to make. Know how to work the oven. Teach your child how to use a conventional oven by reading this story on eHow. Learn the health benefits of cooking from scratch. Bizymoms share how teaching kids to cook allows them to make healthier eating choices. Learn how to brown meat. Lynn’s Cooking Adventures explains the benefits of cooking with ground beef. Know how to use a slow cooker. Kids can cook many things in a slow cooker, which is a safer method for young children because there is no active heat for many recipes. Kids Cooking Activities explains various ways to use a slow cooker. Learn how to cook pancakes. Food Editorials explains how to make pancakes with your kids. Unfortunately, doing laundry is a fact of life for most people. For this reason, it’s important to teach your kids how to wash and dry their own clothes. Kids as young as two can put dirty clothes in the hamper, preschool aged kids can sort their clothes by color and older elementary school kids can start doing laundry. While there will be failures from time to time as they learn their way around the laundry room, failing is just a step in the learning process. Here are 10 life lessons related to laundry. Know how to sort your clothes by color. Revelle College put together an article explaining how to do laundry and sort clothes. Learn to read the labels. Jennifer Maddrell explains how to read the care label on your clothes and shows an example of one in this post. Understand why different types of clothes need to be washed at different temperatures. Ladies Home Journal explains the different temperatures you should wash different types of clothes in. Know that you start the washer before you put in the clothes. Lucy Dakota points out that once you’ve sorted your clothes and are ready to wash them you need to start the washer, add the detergent and then put in the clothes. Discover how to hand wash your clothes. Family Share goes over the steps necessary to hand wash your clothes. Check pockets before washing. The last thing you want to do is wash your homework, a check or a tissue because you didn’t check the pockets first. Denise Handlon explains the steps for washing clothes. Learn how to treat stains on clothes. It’s important to check each clothing item for stains and treat them before they go into the wash, recommends Houzz. Tips for how to fold clothes. Mama’s Laundry Talk has a paragraph for each clothing type, as well as how to fold them. Know how to line dry your clothes. The Old School explains how to hang clothes on a line so that they dry quicker and end up less wrinkled. Learn tips for ironing. Some occasions will require an ironed shirt, and if you don’t have the money to take it to the cleaners you may needs the tips found on Chicago Tribune. Mom isn’t going to be around to pick up after the kids forever, so it’s important that kids learn different housekeeping skills. All of these skills can be taught while the child is still at home by having him help you out around the house. How to clean the floors. Tenant explains step-by-step how to go about mopping the floor. Learn how to vacuum efficiently. For Dummies suggests vacuuming the floors last because dirt can fall on it while cleaning other areas. Discover the tips and tricks of dusting. The Nest goes over how to dust as well as how to prevent some dirt from coming into your space. How to load a dishwasher. Review the tips offered by GE Appliances on how to properly load a dishwasher. Learn how to wash dishes by hand. If there isn’t a dishwasher or if there are just a few dishes that need to be washed, there are a bunch of pictures on Instructables showing how to wash dishes by hand. Find out how to properly clean a toilet. Apartment Therapy explains how to clean the toilet inside and out and details the supplies you will need. Learn how to clean a messy stove. Everyone can benefit from the tips The Kitchn gives on cleaning a messy stove. Speed-clean your refrigerator. Real Simple has step-by-step instructions on how to thoroughly clean your refrigerator inside and out. Figure out how to clean windows using vinegar and newspapers. Go green and cheap by cleaning your windows with these common household items, as explained by Good Housekeeping. Use a pillow case to clean a ceiling fan. One Good Thing by Jillee shows how quick and simple it is to clean your ceiling fan by catching the dust in a pillow case. Knowing how to handle money can make a huge difference in how comfortable your child’s life is. If your child never learns to save, he may end up struggling with debt his whole life. There are money managing tips that you can teach very young children, but if you’ve missed that window it’s never too late to start. Take a look at these 10 money-related life lessons. Determine a need versus a want. PBS Kids illustrates the difference between a need and a want in a kid-friendly way. Comparison shop. Money Management suggests that kids learn to comparison shop in a grocery store to learn how to determine which deals are the best. Give an allowance. Once you start giving your child an allowance you need to discuss how the money will be spent, explains Oprah. Teach kids to save once they start earning money. Money CNN explains that if your child has trouble saving you may want to give them an incentive to do so, like matching the money they put into savings. Understand real world expenses. Kiplinger discusses a math project with 8th graders that has the students theoretically get a job, pay bills and get a house. If they were late paying their bills, their teacher would penalize them $35. Teach kids to give some of their money away. Kids can choose to give money to their church, a charity or some other cause, but they need to get used to charitable giving, says Forever Family. Know how to make and follow a budget. Parent Further explains the importance of teaching kids how to make and implement a budget. Money has to be earned. Money US News says that playing games with money will help familiarize kids with the concept of earning money for completing various tasks. Everything you see advertised on TV is not true. Life Family Education wants kids to understand that products sold on TV may not live up to the hype and could be a waste of money. Know how credit works. Make Use Of has a list of 10 sites that have various online games that deal with making financial decisions. Most self-regulation of emotions happens in early childhood. Kids and teens can sometimes get overwhelmed with emotion and not know how to cope with it, resorting to anger to express how they’re feeling. These 10 life lessons regarding handling your emotions can be vital to the happiness of your child. Know how to name the emotions you are feeling. Children don’t always know the words to express what they are feeling or how to constructively deal with these emotions, states Michigan State University. Develop empathy. Penn State Extension explains that young children are selfish by nature and need to learn to think of others’ feelings. Empathy comes into play every day. Know that bad feelings are temporary. Huffington Post details how kids can regulate their emotions. It’s important that kids understand that bad feelings don’t last forever. Assert yourself respectfully. Parents Place talks about being a life coach for your child and giving him the tools he needs to effectively get through life and manage his emotions. Learn how to express emotions properly. Simple Kids goes over the PIE concept, which stands for Process, Identify and Express. Take note from others who regulate their emotions well. Move with Me suggests that adults model the skill of regulating emotions to their kids. Learn from your failures. Parenting Science notes that kids can learn from their mistakes, and it’s important for parents to encourage this learning. Find healthy ways to regulate your emotions. Rushing to Yoga gives an example where being aware of certain feelings in your body can give you an opportunity to breathe through the feeling and respond to it versus simply reacting to it. Be open to help from others. Seen Magazine explains the steps to help a child identify triggers and learn what they need to do to move from emotional overload to emotional regulation. Be mindful. Mind Shift talks about how kids are technology junkies and need time to un-plug their brain and just be mindful. Learning to be mindful in silence will help them be mindful during conflict. Stress is an unavoidable part of life and something that every person experiences. The key is to figure out how to cope with that stress. Do you let it take over your life and become more and more agitated? Or do you have a way to cope with stress that allows you to use it for motivation? These 10 life lessons will help kids learn to deal with stress in a healthy way. Know when to ask for help with stress. Psychology Today explains that kids will find comfort in unhealthy foods when they are stressed if they aren’t taught constructive ways to cope. Reach out to those closest to you for support. Link to Yourself explains that when things get really stressful it’s important to reach out to those that love you for help. Get excess stress out physically. Pain Action describes how to identify stressors and then advises you to do something physical to reduce the stress. Learn your stressors. Lesson on Stress lists what might be stressing teens out and how they can cope. Try to focus on one thing at a time. Oftentimes people multi-task because they think they are being productive, but this can just lead to stress. Try to do one thing at a time instead, suggests Zen Habits. Determine what you can control and what you can’t. By realizing there are things in your life that are out of your control you can reduce your stress, advises Better Life Lessons. Have a hobby that you can do during times of stress. Taking some time away from what is stressing you out and doing something enjoyable can be a smart way to reduce stress, suggests Brian Smith. Just make sure you don’t use it to avoid things. Remove stressors in your life if you can. If there is a person that causes your child stress, suggest that he stop hanging around him, recommends Good Life Tips. Minimize the importance of the stressor. Tiny Buddha explains how to pretend to be filming yourself in a moment of stress and then pull the camera back so that you get smaller and smaller. Just laugh. Mayo Clinic points out that laughter can relieve stress in the short term and improve your mood in the long term. Learning to communicate well with others, both in work and in play, is a crucial life skill. There are different ways to communicate, and you can get ahead of the game by understanding how to communicate with different people. For example, at work you may find that some people like to communicate through e-mail and just want an outline or the results of a project, while others may want to meet face-to-face and hear about all the details. The sooner you can learn how people prefer to communicate the better off you’ll be. Interpersonal conversation involves every part of you, from the way you are standing to the expression on your face to the tone of your voice. Apply these 10 life lessons to master the art of communication. Build contacts and relationships. According to Skills You Need, interpersonal communication tools are important for giving and receiving information and making contacts with people. Constantly try to improve your communication skills. Udemy suggests that your child can improve his interpersonal communications by watching how he communicates on a video. Develop empathy for others. Reserve judgment and try to figure out what the other person is feeling, even if it means asking some polite questions, posts Slideshare. Interpersonal communication helps you convey more than just the facts. Small Business Chron explains that communicating is different than interpersonal communication. Learn to block out the noise that prevents understanding. ASTD points out that if someone has a different communication style than a co-worker, he needs to look at the conversation from a different view point. Be aware and interpret context in a conversation. When someone says something pay attention to the tone to their voice, look on their face, posture and more, explains PSTCC. Don’t interrupt others when they are speaking. Listen to your child when they are talking without interrupting so they can learn to do the same, says Wikihow. Use your interpersonal skills to facilitate others. MIT Human Resources shares that the more your child knows about how other people communicate the better he will be able to work with groups. Don’t make personal attacks. Communication and Conflict explains that you can disagree with the point a person is making without making that disagreement personal. Speak in a way you can be understood. Teach your child to communicate in a way that is appropriate for the audience, recommends Springer Link. Teaching your child the value of hard work can be difficult. Many people start when the child is young by making him responsible for doing chores. But even if your child is a teenager, there are still ways to instill a good work ethic. 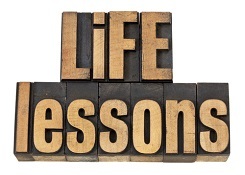 Take a look at these 10 life lessons and see if you can teach some of them to your child. Know how to be a contributing member of the family. She Knows explains that giving your child jobs to complete around the house helps develop a work ethic. Challenge yourself to do difficult things. Tall Trees Grow Deep suggests that putting kids in a tough situation and encouraging them will help them learn to rise to the occasion. Set goals and expectations for yourself. Boystown recommends that you set a goal for your child and then give him the tools to reach that goal. As a child gets older he can start setting his own goals. Anything worth doing takes work. When you are praising your child make sure that you praise the effort and not the end result to emphasize the work that went into it, illustrates School Family. Never be afraid to try, even if you sometimes fail. Money Crashers points out that sometimes kids won’t do the best job cleaning, but if you assign them the job they will improve over time and develop a good work ethic. Always be open to learning from others. Whether you are working in the garden or knitting a sweater, your child needs to see you working hard to master something, urges Craig Playstead. Work hard for the things you want. Aha Parenting points out that kids take better care of things they have to work hard for versus things that are just handed to them. Take pride in a job well done. By having your children work alongside you as you clean you will teach them that cleaning is a part of life and hard work is rewarded by a job well done, says Examiner. You won’t get everything you want in life. Kids need to learn that they have to work for things in life and that they won’t be given everything they want, explains The Juppy. Practice perseverance. Roots of Action states that kids who’ve had to work for things have a higher self-esteem than those who didn’t. Habits take time to develop, and the sooner you can help your kids develop smart habits the better off they will be. Some habits are part of general hygiene, like brushing teeth, while others are health related, like eating right and exercising. Some habits will just make life more enjoyable, like time management and keeping a clean house. Use these 10 life lessons to help your child develop smart habits. Save part of every paycheck. Info Please talks about delayed gratification and how much more satisfying it is to get something you’ve had to wait for. Eat a rainbow every day. Kids who eat a colorful diet of fruits and vegetables will be healthier, says Tesco Living. Make exercise a habit. Cardiosmart explains that active kids will grow into healthy and active adults if they can make exercise a habit now. Use a calendar to stay organized. World of Psychology encourages kids to learn to use a calendar to track homework and other activities. Brush your teeth twice a day and floss. Developing these habits at a young age will almost always guarantee that those teeth will last a lifetime, advises James Poyak, DDS. Do work before you play. Good homework habits will continue to help your child all the way through school, explains Pop Sugar. Focus on your food when you eat. Web MD encourages kids to make a habit of consciously eating instead of just grabbing a bite. Clean up daily. The Bump suggests asking your child to clean up his room daily; after a couple months it will become a habit and you won’t need to remind him. Cover your mouth when you cough. Live Strong points out the importance of covering your mouth when you cough so that you don’t spread germs. Make a habit of washing your hands often. Germs can spread easily, so if you get your kids in the habit of washing their hands they will limit the spread of germs, says WSIL TV.